First, this is our 2nd cruise with the Regal. Boarding was awesome, however recommend not to pre order your medallion,wait until you get to terminal. They are still working out the kinks with this process. For example,we ordered our medallion 3 wks before our cruise, however received another passengers medallion and someone else got ours. The Technolgy on the ship is amazing and blows all other cruise lines away. It’s so cool because their are cool apps you can download like ocean ready, ocean compass and play ocean. We used play ocean because of all the Triva games and new ones every day. We stayed in a balcony, D332 it was ok however we had to look down on a life boat, not cool. Our steward was Denchi he did and awesome job! Cabin was always clean, only wish Princes would install USB ports near the beds and a outlet in the bathroom. Our most memorable moment regarding entertainment was the group Beatlemania they were amazing, sounded and looked just like the Beatles. We didn’t go to any other shows,most were the Princes dancers which have seen before and the comedians according some of the passengers were only so so. We did however like the The Voice of the Ocean it was very similar to the real Voice. Regarding meals, we love that Princes still does not charge with Room service unlike other cruise lines. We used this service often. The only complaint would have to be the Horizon Buffett. It appeared to be lacking variety and served same food every morning and the lunches were also lacking. The main issue was they would take the lunch Buffett food down by 2:00 to prepare for dinner, so we just went to Alfredo’s Pizza which is free and amazing. We ate at the Crown Grill their steaks were amazing, however I think the choices on their menus are over tops, meaning just a salad would be nice, not all this fancy food . Can’t say enough about the pastry chef amazing desserts with every meal. The dining room meals were ok,again kind of over the top..keep it simple. We bought the beverage package, so totally worth it, unlike other cruise lines you get top shelf without any extra cost. Love the activities, so nice to see Oz who came from another cruise line. We played lots of Triva and met new friends, I wish they would have the Triva not in Princes Live no tables and can’t get your chairs in a circle. Wasn’t crazy about the Cruise Director never saw her except for special events. Love Alfredios Pizza especially Mica our sweet waitress. And omg the Lady Luck lady who hosted Bingo spoke to the passengers like we were kindergarten kids, awful and annoying. 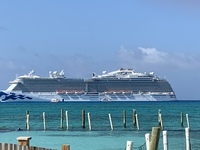 Our excursions to Princes Cay was the best, rented a 9.00 raft and enjoyed relaxing. Try to take the first boat off so you can get a good spot and a raft. Paid for a excursion at St Thomas, we took the St John Champagne tour it was second time going, however it was different they hired a new girl and she get pouring champagne mixed with rum punch, not smart... Dissembarking was quite easy we used Princes Transfer to the airport it cost but worth it. Because we opt to come one day earl, we rented a car best idea ever. Alamo rental has a car rental at the port you can drop your car off and a shuttle will take you to the port.. One last note during our cruise a small plane crashed with 2 men overboard, the Regal was the closest ship, Captain and crew did a fanstatic job with the rescue, both men were saved because of their expertise and speed. First, this is our 2nd cruise with the Regal. Boarding was awesome, however recommend not to pre order your medallion,wait until you get to terminal. They are still working out the kinks with this process. For example,we ordered our medallion 3 wks before our cruise, however received another passengers medallion and someone else got ours. 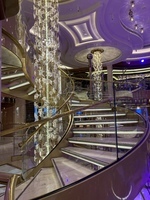 The Technolgy on the ship is amazing and blows all other cruise lines away. It’s so cool because their are cool apps you can download like ocean ready, ocean compass and play ocean. We used play ocean because of all the Triva games and new ones every day. We stayed in a balcony, D332 it was ok however we had to look down on a life boat, not cool. Our steward was Denchi he did and awesome job! Cabin was always clean, only wish Princes would install USB ports near the beds and a outlet in the bathroom. Our most memorable moment regarding entertainment was the group Beatlemania they were amazing, sounded and looked just like the Beatles. We didn’t go to any other shows,most were the Princes dancers which have seen before and the comedians according some of the passengers were only so so. We did however like the The Voice of the Ocean it was very similar to the real Voice. Regarding meals, we love that Princes still does not charge with Room service unlike other cruise lines. We used this service often. The only complaint would have to be the Horizon Buffett. It appeared to be lacking variety and served same food every morning and the lunches were also lacking. The main issue was they would take the lunch Buffett food down by 2:00 to prepare for dinner, so we just went to Alfredo’s Pizza which is free and amazing. We ate at the Crown Grill their steaks were amazing, however I think the choices on their menus are over tops, meaning just a salad would be nice, not all this fancy food . Can’t say enough about the pastry chef amazing desserts with every meal. The dining room meals were ok,again kind of over the top..keep it simple. We bought the beverage package, so totally worth it, unlike other cruise lines you get top shelf without any extra cost. Love the activities, so nice to see Oz who came from another cruise line. We played lots of Triva and met new friends, I wish they would have the Triva not in Princes Live no tables and can’t get your chairs in a circle. Wasn’t crazy about the Cruise Director never saw her except for special events. Love Alfredios Pizza especially Mica our sweet waitress. And omg the Lady Luck lady who hosted Bingo spoke to the passengers like we were kindergarten kids, awful and annoying. Dissembarking was quite easy we used Princes Transfer to the airport it cost but worth it. Because we opt to come one day earl, we rented a car best idea ever. Alamo rental has a car rental at the port you can drop your car off and a shuttle will take you to the port..
One last note during our cruise a small plane crashed with 2 men overboard, the Regal was the closest ship, Captain and crew did a fanstatic job with the rescue, both men were saved because of their expertise and speed. Has a life boat, doesn’t obscure the view just when you look down you don’t see the water, other then that it was clean and excellent service.